I completely forgot that Erik Murphy is the biggest basketball recruit to come out of Rhode Island since Marvin "Bad News" Barnes. He's headed to Florida and has a rating of 96, which means he has the potential to significantly contribute as a freshman for most national programs. He could be a three- or four-year starter and have an opportunity for all-league honors, according to Scout, Inc's grading system. Since he's 6'10 and headed to Florida, which is a major program, you have to figure he has a great shot at making the NBA one day. Hey, if you are 6'10 and can shoot from the outside, I'm sure you are going to get a long look by the NBA. Murphy is ranked as the 22nd best player in the class of 2009 and the 7th best PF, but unfortunately was not selected to play in McDonald's All-American game. January, 2009: Murphy has very good touch and finishes very well around the basket, using either his right or left hand for hoops in the paint. He has impeccable footwork around the basket. He has a great feel for the game, but he will have to get significantly stronger for the next level, which will not only make him a better finisher, but also will keep defenders from getting into his body when he gets the ball on the low block. Murphy will shoot jumpers and can make a living hitting jumpers in transition as a trailer as well as in pick-and-pop sets. He has range that extends out to the 3-point line, though he does not have a quick release. Murphy does a good job of running the floor and will fit perfectly in the up-tempo style of play that Florida employs. Murphy does not block shots at a high rate, therefore he needs to be paired with a more rugged big man when he plays on the next level. November, 2008: Murphy will have to increase his strength level, but he has a dazzling collection of skills that will take him a long way in college. He has very sound footwork in the post and does a good job using counter moves as well as either hand in the post to finish with jump hooks. He also does a very good job of keeping the ball high when he gets it in the post or when he rebounds the rock. Murphy also has enough quickness to exploit slower big man on the perimeter by driving past them. If the big that guards him does not want to come away from the paint, Murphy will connect on jumpers with range that extends out to the 3-point line, which will help to stretch defenses and bring shot blockers away from the rim, thus opening up driving lanes. His shooting ability as well as his passing skills makes him perfect for high-low alignments on offense as well as offensive sets that utilizes the pick-and-pop, which more teams now run in college. Murphy also has the ability to handle the ball on the break and spot open teammates, a valuable tool considering that he will play at Florida next season where they rely heavily on the fastbreak. Murphy also understands the game very well and has a great feel for basketball and a high basketball I.Q. August, 2008: Murphy is a skilled face up power forward. He is long, wiry and athletic enough to get your attention. Murphy plays with good effort, toughness and he competes. He has a great feel for the game on both ends of the floor. On offense he does all the little things like attempting to set screens and helping to defend multiple screening actions like on ball screens and down screens on defense. In transition he runs the floor well and can finish above the rim. An excellent reader of guard penetration and knows how to make himself available in an area the he can be affective with his mid range jumper or swing step to the rim along the baseline. Murphy has an excellent touch around the basket and can score with either hand and with his jump hook but must be a more consistent finisher. He handles the ball well on the wing and in the open court which allows him to score on drives and slashes to the rim. A good defensive rebounder mostly because of his consistent effort to hit the glass and can block shots mostly coming in from the weak side. Must get stronger in order to add the physical part of the game to his mental assets. Great upside and should improve rapidly when he gets to Gainesville. June, 2008: Murphy was one of the more intriguing prospects I saw over the weekend (2008 Fullcourt Press Showcase). During the shooting drills he was lights out. His stroke is very smooth and he has range out beyond 20-feet. He has a solid looking frame with fairly long arms and overall ideal length for the 4/3 position. However, he needs to get considerably stronger for him to be an impact player during the 2009-10 season. During the scrimmage he got bounced around the paint area and struggled scoring in traffic%u2014not too mention he shied away from contact on more than one occasion. He does have outstanding face-up 4-man skills but he needs to become a much more aggressive player on the inside to make his game complete. December, 2007: Son of former Boston College standout, Jay Murphy, Erik Murphy is a multi-dimensional power forward who can score from the perimeter and the post. He is a very active floor runner and owns a good pair of hands. His court IQ is excellent and his unselfishness makes him a fine teammate. This ambidextrous finisher is a weight program away from being a complete player. November, 2007: Erik is a skilled post player that can step out and hit 17 to 19 foot jump shots with his feet set. 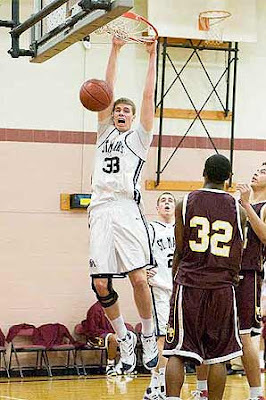 He is the son of former Boston College great and NBA player Jay Murphy. Erik has gotten stronger over the past 6 months. He was injured in June and did not play a lot over the summer. He has good skills for a post player and has been well taught by his father. He is a decent defender but not a shotblocker. He has decent basketball athleticism. Erik is a good scorer on the block. He does not move as well as he did before he got bigger but he is still solid in that area. Erik is a top 75 player nationally in the class of 2009.